Join us and breathe in the fragrance of the island's pine forests, and soak in the Adriatic Sea, go on nature hikes, or dive into the culture of the charming old towns of Brac. Enjoy yoga by the pool, amazing organic food from our garden, lazy around on the beach, honor your body, and create lasting friendships. With twice daily asana classes, meditation, pranayama and talks on yoga, you will have a chance to immerse yourself fully into a yogic lifestyle. We will begin our morning practice with meditation and pranayama followed by a different Vinyasa flow sequence each day. Mindfulness and focus on breath are an integral part of class and attention is always given to proper alignment of physical body in order to align the subtle. The morning practice will energize the mind and body for the day ahead. Modifications are always given, beginners are welcome. Our luxury beach villa can accommodate up to 17 people. Most of the rooms offer spectacular sea views right from your beds. The villa has two yoga spaces –an indoor shala in the rare case of rain, and an outdoor space overlooking the swimming pool and the beach. You can choose between single, double and triple accommodation with or without seaview, and with ensuite or shared bathrooms. All rooms are equipped with wireless internet and air-conditioning. All bathrooms are equipped with hair driers, soaps, shampoos, toilet paper, towels and are cleaned daily. As healthy and well balanced vegetarian meals are very important to us, and to ensure the best possible quality of every ingredient and every meal served on the retreat, we always bring our own chef on Croatian retreats. Our chef will create for you wonderful healthy meals using as much local produce as possible. Our beach villa has its own organic garden, so this year we will have a real garden-to-table experience. We cater for all of your needs (vegan, gluten free etc. ), just let us know on the registration form. Bioresonance for food and chemical sensitivities session: this is a holistic non-invasive treatment that uses your body’s own electromagnetic wave patterns to identify and treat, amongst other issues, sensitivities to food and chemicals. The session can include a diagnosis, immediate treatment, and advice comprised of guidance in diet, and lifestyle. A range of massages with or without the use of oil and lotions. Island Brač is most famous for its radiant white stone, (used to build the White House in Washington, DC!) and for the long pebble beach at Bolthat dramatically extends into the crystal Adriatic Sea. However, the island's true intrinsic beauty lies in its sleepy medieval villages, charming seaside towns, and stunning Mediterranean landscapes of steep cliffs, crystal waters, pine forests, and unspoiled nature! Our Villa is situated right on the beach in the centre of village Mirca, only 3km west from Supetar, which is the port for ferries connecting the island Brac with the biggest Dalmatian town Split. The ferries go often and the journey takes 50 minutes. The closest international airport is Split airport on the mainland. Split airport is connected with most of the major European airports, -many of them are direct flights. Some low cost companies like EASY JET, GERMAN WINGS, WIZZAIR, JET2com, NORWEGIAN, Vueling, Transavia also fly to Split. We can help you with transfers from the airport to the villa by minibus (via Split ferry port) o ar by private speed boat directly from the airport to the pier in front of the villa. Please note, there is also a smaller international airport on Brac, usually served by private jets. BUS: Split is very well connected to Zagreb by trains and public buses. Step 4. Submit your Deposit of 400eur. Full Payment is due 30 days before the start of the retreat, by May 17th, 2017. Payment is by wire transfer or Paypal and subject to an additional 5% transaction fee. 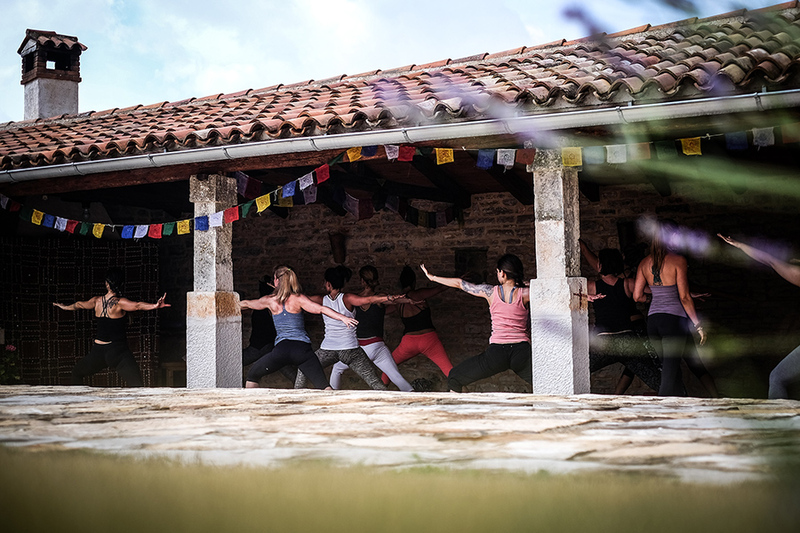 For our guests from Croatia, payment is also possible at the Sangha Yoga Center, Zagreb. Please get our confirmation email before you make any air flight ticket purchase- a minimum of 6 Registered Participants is required to run this retreat. In the very unlikely event of retreat cancellation, your payment or deposit will be refunded.